16 year old Jake Prowse worked for Aerosaurus on a work experience week. During his time with Aerosaurus Balloons he went on a training flight with Private Pilot, Charlie Street, who was helping Tom Hoare build up his hours for his PPL (B) license. Last Friday I had the experience of sitting in on an Aerosaurus pilot training flight. We went from the base in Exeter to a launch site in Tiverton. We took the 120 balloon, which stands for the envelope size which is 120 000 cubic feet. The flight lasted just over an hour, but as this was not a commercial flight we did not have champagne on board! We landed down near Honiton and hour later after doing some practice touch downs! When we got back to the yard the much bigger 16 passenger 317 thousand cubic feet balloon was there. It had just come up from down in Devon. The 210 thousand cubic feet balloon had just been taken up to Salisbury where the flights had just started as we can not fly up there before the 1st of August. After seeing the training flight I have made my mind up that I am going to start learning and go for my license. 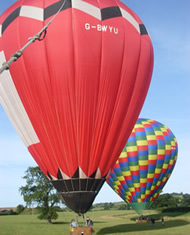 Then I can fly anywhere; from Launceston through Plymouth up to Somerset, I could be your pilot on your very own champagne balloon flight, some in the South West!